Update: Did you miss this event? You can watch the full webinar and download the slides on Pragmatic Marketing’s website. Enjoy! The wonderful folks at Pragmatic Marketing have asked us to be part of their Pragmatic Live webinar series. 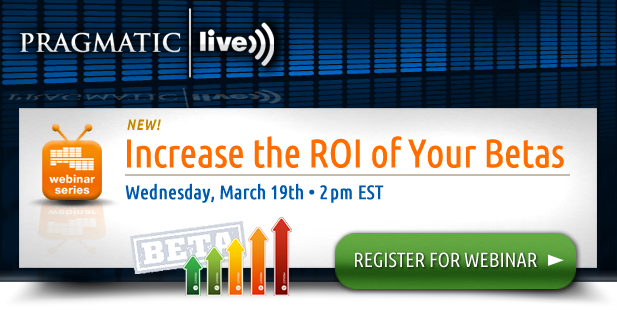 So, on Wednesday March 19th at 11 am PST / 2 pm EST we’ll be hosting a webinar on increasing the ROI of your beta tests. This hour-long presentation from Centercode CEO Luke Freiler will be packed with advice aimed at helping product professionals get more out of their beta programs. We’ll be sharing best practices from our years of working with the top names in tech to launch and improve their beta programs. Whether you’ve run one beta or one hundred, this webinar will have some useful advice for your next beta test. Be sure to join us!